This was how Elizabeth Ramos related her experiences with the Kalibo Mangrove Reforestation Project in the barangay of New Buswang, on the island of Panay in the central Philippines. New Buswang, located in the municipality of Kalibo, is situated 174 kilometres north of Iloilo City, and is one of the departure points for excursions to tourist sites on the world-famous island of Boracay. The flood-prone barangay is located at the mouth of the Aklan River - about two kilometres from the centre of the municipality. Residents of the area are mostly fisherfolk and subsistence farmers. Elaborating on what she described as her "miracle," Mrs Ramos reported how a vast area of mudflats was transformed into beautiful mangrove forest capable of supporting ecotourism businesses. Prior to the reforestation programme, there was almost no vegetation growing in the area and the community was exposed to the ravages of the sea and severe river flooding during typhoons and heavy rains. "It was just an open area of knee-deep mud," she added, "this mudflat area was a source of major problems for the residents - especially during the rainy season." During 1989, Attorney Fulgencio Factoran, the Secretary of the Department of Environment and Natural Resources (DENR), visited the province of Aklan and witnessed first hand the depressing condition of the area. Immediately, he instructed local environment officials to map out a strategy for reforesting areas around the mouth of the Aklan River as a means of mitigating the ongoing damage from storms and flooding. A planning process was conducted, and several months later, the DENR approved the mangrove reforestation project and awarded a US$22 500 contract to the municipal government of Kalibo to implement it. The contract was signed in January 1990. An area near the Sooc River at barangay New Buswang was chosen as the principal site for the reforestation project because of the broad expanse of mudflats in the vicinity. The site was almost completely devoid of vegetation, so successful implementation of the project was expected to provide an effective demonstration of the value of mangrove forests in buffering the community against bad weather. The municipal government planned to implement the afforestation contract by encouraging residents of four surrounding barangays in the project area (Old Buswang, New Buswang, Bakhaw Sur and Bakhaw Norte) to organize groups to plant thousands of mangrove seedlings on 50 hectares of sprawling mudflats. Payments to the planters were to be made by the municipal government using funds from the contract. 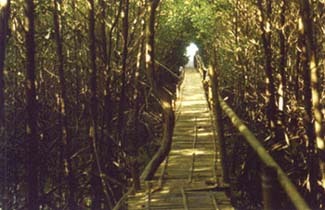 Visitors' walkway leading through mangrove forest to the beach area (courtesy Ernesto A. Cadaweng). Mrs Ramos was one of the first residents to be convinced by barangay officials to plant propagules (mangrove seedlings) under the reforestation project. However, many of her neighbours refused to cooperate in planting the propagules at first. "They were apprehensive that they might not ever be paid for their work," she explained. To help allay the residents' apprehensions, Mayor Allen Quimpo subcontracted a non-governmental organization - the United Services and Welfare Assistance Group (USWAG) Development Foundation - to supervise the project and carry out coordination on behalf of the local government. The USWAG Development Foundation was perceived as an appropriate implementing agency, given its key objective of improving the lives of poor people in the community, particularly women and those involved in agriculture. Initially, only 15 families from the barangays of Old and New Buswang expressed interest in being involved in reforestation activities. However, with persuasion from the municipal government, others joined, doubling the number of participants to 30 families. Once initial apprehensions about payments were overcome, the opportunity to earn money through the project had significant appeal to the impoverished residents. The municipal government provided the seedlings and paid approximately one US cent for each propagule planted. DENR officials supervised the allocation of planting areas to the planters. "In order to ensure fairness, a system of drawing lots was used. Planters drew slips of paper from a 'hat' so their assigned planting areas were allocated randomly. This helped to minimize complaints and ensure smooth operations," explained Allen Quimpo, the former mayor. "During the plantation establishment, the planters were often stuck in knee-deep mud, battling against strong waves and winds. The planters - assisted by their families - persisted against all odds," said Didi Quimpo, the Chairperson of the USWAG Development Foundation. In the weeks immediately following the mass planting operation, questions began to arise as to who would protect, maintain and manage the reforested area in the long run. Mrs Ramos was among several people who questioned the USWAG Development Foundation about the immediate and long-term future of the project. These were questions that needed immediate answers. Didi Quimpo took the initiative - after consultation with the municipal government and community members - to organize the planters into a community forest protection organization, which they named the Kalibo Save the Mangroves Association (KASAMA). Staff from the USWAG Development Foundation facilitated the formulation of the new association's constitution and by-laws. In July 1990, the association held its first elections and was formally registered with the Bureau of Rural Workers under the Department of Labor and Employment. Francisco Sutoniel, one of the original planters, was elected as the first KASAMA chairperson. The new forest protection group organized the community to check the planted propagules regularly to prevent them from being washed away by high tides, to replace the dead propagules and to protect the area from animals and human intruders. KASAMA has since become a model for how community-based organizations can help assure the sustainability of a forest project. The contribution of the newly organized planters was indispensable in protecting the planted mangroves, because they offered a constant presence in the area. "The unity demonstrated by KASAMA has been directly responsible for minimizing incidents of illegal cutting in the mangrove area. KASAMA offers a far better means of protection than the local government could otherwise afford," indicated Ms Quimpo. The sacrifices of the planters eventually paid off. In April 1994, KASAMA was awarded a Forest Land Management Agreement (FLMA) by the DENR. KASAMA's efforts were deemed sufficiently noteworthy that the agreement documents were presented to the association's representatives directly by President Fidel Ramos in a ceremony at Malacañang Palace. The Forest Land Management Agreement between the DENR and KASAMA gives KASAMA tenurial rights over the reforested area for 25 years, with a right of renewal for an additional 25 years. The agreement stipulates that KASAMA has rights to sell, process, or otherwise utilize all products grown in the New Buswang mangrove area, in exchange for undertaking long-term maintenance and protection of the forest. In December 2000, the Forest Land Management Agreement was converted to a Community-based Forest Management Agreement (CBFMA), with similar terms and conditions. In the meantime, Allen Quimpo's career had progressed from town mayor to his election, in 1995, as Congressman representing Aklan. His new position enabled him to provide tangible support to the reforestation project by allocating approximately US$4 200 from his Congressional District Fund for a new 7-hectare mangrove reforestation project to be undertaken by KASAMA. Shortly afterwards the DENR contracted KASAMA to implement mangrove reforestation on an adjoining 13-hectare mudflat. These additional contracts added 20 hectares to the original 50 hectares, and expanded the original planting of 222 000 propagules to 311 000 propagules and seedlings. KASAMA planted 65 hectares with mangrove tree species, while the remaining 5 hectares were planted with nypa (Nypa fruticans) - a mangrove palm, the fronds of which are used for thatching roofs. Significantly, the additional contracts were implemented successfully with minimal super vision from either the local government or the USWAG Development Foundation. KASAMA was able to organize planting, maintenance and protection on its own, thereby demonstrating the maturity of the organization. It was particularly effective in protecting and maintaining the new plantings, which are now almost two metres high. The earlier plantings now stand above 10 metres in height and some of the trees are 25 to 30 centimetres in diameter. In accordance with the terms of their CBFMA, KASAMA will be allowed to utilize the forest once the trees reach a harvestable size. At present, some members of the organization supplement their incomes by collecting shellfish and crabs among the mangroves. Others work in the ecopark which has been established, and many have continued with their original livelihoods as fisherfolk and farmers. By 1994, the Kalibo Mangrove Reforestation Project - in addition to attracting Presidential notice - was also receiving management awards. The project was presented initially with the Galing Pook Award, which aims to promote innovation and excellence in local governance. The award is presented annually by the Centre for Development Management of the Asian Institute of Management. The indisputable success of the mangrove project has led to the DENR's Community Environment and Natural Resources Office in Kalibo garnering the prestigious Eagle Award for Excellence. This honour is given by the DENR as a commendation for excellent performance to its leading regional and provincial offices. In June 1995, DENR issued awards of recognition to KASAMA and the USWAG Development Foundation - citing their efforts and continued support for environmental protection. In 1996, Ms Medelyn Quadra, the project coordinator assigned by DENR, was recognized as the most outstanding woman project implementer - through her receipt of the Gender and Development Award - from DENR Secretary Victor Ramos. KASAMA and the experiences in developing the Kalibo mangroves eventually became the models for mangrove reforestation projects in the west central region of the country. The initiative also became a showcase for prestigious visitors, including groups from the Asian Development Bank, the Overseas Economic Cooperation Fund, various review missions, the United States of America Peace Corps and universities. The evident success of the project motivated Allen Quimpo's successor - Mayor Diego Luces - to continue the drive for sustainable management of the mangrove reforestation area. "The mangrove forest has been recognized with several national awards because of its strong initiatives - so this gem of Kalibo should be properly maintained and promoted," stated Mayor Luces. In the Philippines, garnering such support is not always straightforward. The incumbent mayor and other elected government officials seldom push for the continuation of projects initiated by their predecessors. Often, rivalries and personality differences invoke different project priorities. But Mayor Luces has continued to support the project driven by his personal goals of reducing erosion in the municipality and making the area a viable sanctuary for birds. Studies and observations reveal that the mangrove forest has become a refuge for a number of bird species. Wild ducks and birds come from nearby regions according to the Philippine Endangered Species and Conservation Project (PESCP) - an NGO dealing with the protection of threatened birds on Panay Island. Following discussions between Mayor Luces, DENR officials, KASAMA and the USWAG Development Foundation, it was decided to designate the mangrove area as an ecotourism site. The plan is to target visitors not only from the province of Aklan, but also from the entire country, and even foreign tourists. After consultations with KASAMA, the local government agreed to further support the mangrove project - including preparing and distributing promotional materials such as bookmarks, leaflets and posters describing the reforestation effort. The promotional materials reached the office of Provincial Governor Florencio Miraflores, who agreed to fund continued protection and conservation of the mangrove area. Similarly, the Congressional District Office - led by Congresswoman Billie Calizo - pledged legislative and financial support to assist in the sustainable management of the reforested area. This support was offered despite Ms Calizo being a political opponent of the Quimpo-led coalition. "Promotion of mangroves is essential to this town. We have a responsibility to help KASAMA alleviate poverty by inviting local and foreign tourists," concluded Ms Calizo, who owns a successful travel agency and is considered an expert on the tourism industry. Alongside the successes, there have been some problems as well. Erlinda Fernandez, one of the original planters and currently Treasurer for KASAMA, admitted that they had suffered several setbacks in managing the mangrove area: "Some of the major problems encountered by KASAMA are the indifference of non-members, logistical difficulties, failed ventures, technical obstacles and illegal encroachment. Some of these problems pose a threat to the long-term sustainability of the project," she surmised. Ms Fernandez singled out logistical difficulties and failed ventures as major problems. In their desire to supplement their livelihoods and incomes, KASAMA members have attempted to establish a number of income-generating projects, many of which eventually failed. Among the failed ventures were: a small store, established using funds provided by the cooperative; a motorized banca (boat with an outrigger) for fishing; and the production of king crabs with assistance from the Southeast Asian Fisheries Development Council (SEAFDEC). "Had these ventures succeeded," she suggested, "KASAMA members would now have better and more affluent lives." According to Didi Quimpo, the majority of these ventures failed due to mismanagement, with the root cause being the lack of educational training of the KASAMA members who supervised the ventures. But amidst these failures, the resilience of KASAMA as an organization was evident. The failures did not distract the members from the core activity of mangrove reforestation, which was the primary reason for bonding together - even though the financial incentives to work on project activities and ventures were very limited. "There is currently not much financial incentive to work on implementing the project ventures, since most of us have to concentrate on our immediate means of livelihood, which is fishing," Elizabeth Ramos observed. Mario Cervantes provides a case in point. He receives a meagre US$2 each month for maintaining and protecting his two-hectare mangrove allotment. And there are times when he receives no payment for several months due to wrangling between the local government and the Department of Environment and Natural Resources. "The local government is rendered helpless in these situations, since it is not legally allowed to disburse or even advance funds of its own," Ms Fernandez complained. In most instances, the USWAG Development Foundation bridged financial gaps for the project. In addition, USWAG also brokered much of the financing for income-generating projects run by KASAMA. As the forest matures, the area's resources are increasingly attractive to outsiders. Encroachment and theft are inevitable threats. Most of the interlopers are nearby residents, who are non-KASAMA members, but see opportunities for exploiting the mangroves. For example, in one instance a retired judge claimed a portion of KASAMA's nypa plantation as an extension of his shoreline landholding. Permanent dikes were constructed around a significant portion of the nypa plantation as boundaries of an expanded fishpond. Members of KASAMA vigorously protested these actions, but in the face of the judge's influence they were ignored. KASAMA was forced to file a case to contest the encroachment in court, invoking their rights as provided by the CBFMA. The court provided an initial validation of their rights by serving a restraining order. The order was defied and the police were required to enforce it by arresting the hired workers. The court's final decision on the case is still pending. Despite these problems, the USWAG Development Foundation encouraged KASAMA members to assume responsibility for managing the entire organization. So far, however, the members have refused, because many of them are getting older and they fear that they could not be effective managers. "Most of us are already old," said Ms Edith Isturis, one of the founding members, "we are too old to start learning to manage the project." To facilitate the eventual transfer of responsibilities, the USWAG Development Foundation is currently conducting leadership training for local youth, especially children of KASAMA members, in the hope of empowering a new generation to take on the responsibility of leading the entire organization. "Who will manage the project once we pass away?" Ms Isturis inquired, "it will be our children. Now that they are grown up, we hope they will maintain the mangrove project we have started - for future generations." Despite the ongoing challenges, prospects for the sustainability of the project are bright. The municipality of Kalibo - with leadership from its current chief executive, Mayor Reymar Rebaldo - has established an ecotourism site in the mangroves. "We have launched the mangrove ecotourism site in coordination with KASAMA. We hope to be successful in promoting it as a regional ecotourism attraction," the mayor stated. The ecotourism dream became a reality when the local government received a grant (US$600 000) from the Australian Agency for International Development (Aus Aid) and the Philippines-Australia Community Assistance Program (PACAP) to develop the area. The ecotourism site - the first in Panay - was opened to the public in April 2003, as part of the highlights of the province's forty-seventh anniversary celebrations. The festivities received extensive coverage in national and regional newspapers. "The area is being promoted as an alternative tourism site alongside Boracay Island and Kalibo's Ati-atihan Festival," said Mayor Rebaldo. Today, the USWAG Development Foundation receives funds for project operations from local and provincial governments, PACAP and the DENR. Didi Quimpo observed that the USWAG Development Foundation recently obtained a PACAP grant totalling approximately US$40 000, which has been used for the construction of ecotourism facilities inside the Kalibo Mangrove Forest. The facilities include bicycle rentals for children and a small restaurant. Profits from the facilities are being used for day-to-day maintenance of the project, including staff wages and salaries. The new facilities employ several members of KASAMA, as well as their adult children. In addition, Governor Miraflores recently released US$2 200 to help repair the visitor walkway used by tourists at the site. The walkway was built through the centre of the mangroves to allow visitors to fully appreciate the natural beauty of the forest. The walk begins at the entrance gate of the ecopark and meanders through mangroves on the western bank of the Aklan River. It crosses the river via a footbridge, passes through a tunnel-like mangrove forest and ends on the beach. The entire walk takes about 20 minutes. Members of KASAMA act as guides for visitors and answer questions regarding the area. Both foreign and domestic tourists visit the park, with a current average of more than 400 visitors per week. Ms Isturis, employed as a cashier at the ecotourism site, reported that tourists from Korea, Australia, the United States of America and Germany are among the visitors to the area. However, most visitors are local tourists. Recently, tourism and environment officials from Cebu City and Antique Province visited the mangrove area as part of a study of development programmes initiated by the Kalibo municipal government. The current perception of the community, as well as the assisting organizations and government agencies involved, is that it is possible to generate significant revenue from ecotourism. There is consequently an emerging consensus that the planted mangroves should be protected totally to maintain the appeal of the area to tourists. The most compelling aspect related to the rehabilitation and management of the Buswang mangroves is the commitment of the local people and the rewards that are slowly accruing through the process of "ownership" for KASAMA. Even before receiving formal tenure recognition, members exhibited stout commitment to the project. But the Forest Land Management Agreement and the CBFMA have institutionalized and legalized the sense of ownership, which is a key factor in the sustainability of the project. The vigilance of KASAMA was demonstrated powerfully in the decisive way it dealt with the case of illegal encroachment on the CBFMA area. It underscored KASAMA's maturity and capability as an organization. Similar vigilance has been maintained against smaller scale encroachment. When illegal reapers of mangroves are caught, they are warned for their first offence, but if apprehended for a second time then a fine is imposed. Members of the organization still patrol the fringes of the mangrove forest, especially areas that are very close to the community or otherwise vulnerable. In 1998, the USWAG Development Foundation deliberately began to reduce support to KASAMA as it was confident that its members were nearly ready to assume independent management. "For several years now, we have been assisting and supervising KASAMA and, as soon as they're ready, we will hand over full responsibility for managing the mangroves to them," Ms Quimpo commented. Despite the success achieved by the mangrove initiative, Mayor Rebaldo admitted that additional funding from both the national and local government and from other non-governmental organizations is still required for the sustainable management of the mangroves. He warned: "Without additional funding, we cannot maximize the potential of the mangrove area, and we do not know that it can continue to be maintained for forthcoming generations." Ernesto A. Cadaweng is a practising forester who has worked with rural communities for most of his career. He is presently Operations Manager of Bagong Pagasa Foundation based in Palawan, where he provides development assistance to an indigenous community in Quezon, Palawan and a community of lowland migrants in Bacungan, Puerto Princesa City. At the same time, he oversees the management of rubber plantations that provide a principal source of funds for the Bagong Pagasa Foundation in yet another community in Kalatagbak, Quezon. Jun Ariolo N. Aguirre is a newswriter and field reporter for Kalibo Cable TV network. He completed his Bachelor of Arts in Communication, majoring in journalism at the Centro Escolar University in Manila. After graduation he worked as a contributor for Sunstar, a regional paper in Panay and also contributed articles for the Philippine Star and Pilipino Star Ngayon. Since 2001, he has served as a correspondent for the Daily Tribune and Panay News. The searing heat, which typifies the waterway-studded Can Gio region of the lower Mekong River in Viet Nam, had abated after the previous night's rain; this signalled the end of the six-month dry season and already the ground appeared fresher and greener. An early riser for all of her life, Ms Nguyen Kim Hoang enjoyed a rare relaxing moment in the quiet dawn gazing at the mangrove trees of the forest that her family had tended for several seasons. The trees were dear to Ms Hoang and her family, who had toiled over them for more than a decade. Sweat, tears - and more than a little blood - had transformed the land that had been allocated to her into a lush forest. The ecological stability of Can Gio is evident in the diverse vegetation, carefully planted to supplement the natural regeneration of the forests. The diversity and structure is almost identical to the forests' original state, which was documented before the war. The recovery is remarkable and attributable to people like Ms Hoang. Ms Hoang is well known in Can Gio - she has lived and worked in the mangrove forest for the past 23 years. Ms Pham Thi Huu, who lives in the Tam Thon Hiep Commune along with the Hoang family, and who has also succeeded in protecting the mangrove forests allocated to her, explained that everyone regarded Ms Hoang as the most enthusiastic forest protector. While chatting with Ms Huu, through the window I noticed a frail woman hurrying towards the door. "Are you from Hanoi?" the woman asked, "I was told that a researcher was here to see me." And so I was finally introduced to Ms Hoang, who has become something of a celebrity as a result of her diligent mangrove rehabilitation work. Twenty-five years ago, Ms Hoang's family was one of the poorest in the commune. She and her husband found it hard to make ends meet, having five children to feed. The family lived in a dilapidated shelter, earning their living by collecting shellfish. 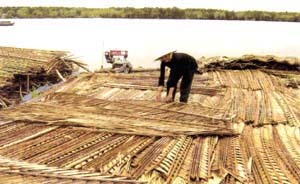 In 1980, the Hoang family was contracted by the Duyen Hai Forestry Enterprise to establish and cultivate about 100 hectares of red mangrove (Rhizophora apiculata) each year. By 1986, the family had planted 482 hectares of mangroves successfully. Ironically though, just when life started to become easier for her, Ms Hoang and her husband separated and she was left to take care of their five children. Ms Hoang wondered how she would be able to feed her children until she realized the answer was standing in front of her - the mangroves. By the late 1980s, however, the mangroves in Can Gio, especially those planted by state agencies, were being threatened. The survival of planted mangroves was poor and poverty-stricken local inhabitants were rampantly felling trees for fuelwood. In 1990, in an effort to mitigate mangrove destruction, the Duyen Hai Forestry Enterprise tried a different approach when it began allocating mangrove forests to impoverished people in the six communes of Can Gio District. Their primary task was to protect allocated areas for 30 years. In exchange, they were paid a monthly wage and allowed to use thinnings and other forest products. The government also promised to facilitate their settlement in the forest on a long-term basis. Ms Hoang - along with nine other families - was among the first to join the scheme. Many were surprised when Ms Hoang readily accepted management responsibility for 171 hectares, with only her eldest son, Nguyen Van To (who was 22), to help her. Her eldest daughter, Nguyen Thu Hong, 19, had married recently and moved far from home. The three remaining children were not yet teenagers, and thus were too small to help with heavy labour. In the beginning, the family experienced severe hardship. The difficult work included land reclamation, tree planting and patrolling the forests. "At that time, cutting of mangroves for firewood or for sale by local poor people was a regular occurrence. When we patrolled during the day, illegal forest exploiters cut down the trees at night, and vice versa. It was a gruelling experience for a family with few resources like ours," Ms Hoang recalled. Can Gio is situated on a recently formed estuary, where the Saigon and Dong Nai rivers discharge into the sea. A network of canals and rivers divide the site into many islets. The dominant vegetation is mangrove forests - both planted and naturally regenerated. The site also supports sea-grass beds and houses many species of mollusks, crustaceans, fish, amphibians and birds - as well as terrestrial animals. In the past, the Can Gio mangrove forest complex covered more than 40 000 hectares. The average tree height was 20 to 25 metres. Before 1945, the mangroves were classified as productive forests and were exploited regularly. The former Saigon regime demarcated 28 000 hectares in Can Gio as protected forests. The remaining area, comprising mainly secondary forest, was exploited randomly. However, the Can Gio ecosystem was almost completely destroyed during the Second Indochina War (1965-1969) by chemical agents and bombing. Following the war, Can Gio was allocated initially to the Duyen Hai District in Dong Nai Province. In 1978, however, management responsibility for Can Gio forest was transferred to Ho Chi Minh City. The area was degraded heavily, with 4 500 hectares of Phoenix paludosa (a prickly wild plant species), 10 000 hectares of barren cracking muddy soil and only 5 600 hectares of cultivable land. The remaining area was covered with unproductive shrubs and bushes. Precious wood-supplying trees such as Rhizophora and Bruguiera had almost vanished. In 1991, Can Gio was designated as a coastal protection forest, in line with Prime Ministerial Decision 173/CT. Subsequently, in 2000, Can Gio was designated as Viet Nam's first Biosphere Reserve under the Man and the Biosphere Reserve Programme of the United Nations Education, Scientific, and Cultural Organization (UNESCO). Today, Can Gio is the largest area of rehabilitated mangrove forest in Viet Nam. But, the story of Can Gio's rehabilitation is not straightforward, and mirrors the experiences and challenges of many other Asia-Pacific countries. In 1978, the People's Committee of Ho Chi Minh City issued a policy for the afforestation and rehabilitation of the Can Gio ecosystem. This was implemented initially by the Duyen Hai Forestry Enterprise. Later on, the central government established plantations on fallow and salt-marsh lands. These government-owned farms were designed not only to alleviate overcrowding and employment pressure in the inner city, but also to produce food and industrial crops including sugar cane, pineapple, cashew nut and eucalyptus. Can Gio forests were designated "production forests," with a view to providing fuelwood and construction timber to the city. However, nearly all of these projects failed due to a combination of poor management, insufficient funding and lack of experience. The project managers, sent from the city and other districts, were not familiar with the local conditions in Can Gio. Farms were established on land that, without mangrove forest cover, had been leached of many of its nutrients and had become acidic and infertile. By 1999, many of the state-run enterprises had abandoned their rehabilitation efforts, returning the land to the city authority, because the crops and forests were growing too slowly to be commercially viable. Many planted areas were abandoned and became vulnerable to illegal exploitation. This wholesale failure forced the government to change its policy and strategies. There was also increasing appreciation of the environmental and social benefits the Can Gio forests could provide. As a result, the Can Gio forest area was reclassified as an "environmental protection forest." Simultaneously, a more effective management strategy was applied by allocating land to local households for protection and management. A Management Board of Environmental Protection Forests of Ho Chi Minh City was established to undertake the strategic forest management functions previously carried out by Duyen Hai Forestry Enterprise. In tandem with this local government strategy, the national Department of Forestry now operates 24 Forestry Units in the Can Gio Zone. Each unit works with its own diversified plan to ensure activities complement the efforts of households in planting and protecting regenerating forest areas. it provided a transparent means of support through the State-funded Management Board, which served as a contact point - providing control, coordination and support to the forest-protecting households so that none of them would work in isolation. Implementation of the strategy followed a carefully structured approach. Initially, the Management Board informed all local communes about the strategy, and households wishing to be allocated land were invited to make a formal application. The communal authorities and the Management Board reviewed each application and those selected were allocated forest lands at meetings where the respective head of the relevant Forestry Unit, representatives from the local commune authority and the district Department of Agriculture were present. Each household was given a record of the allocation, a contract for forest management and a detailed map of the allocated area (at a scale of 1:10 000). The allocations were formalized by the Ho Chi Minh City People's Committee. "As soon as I took the land," Ms Hoang recalled, "I found it very difficult. Without any boat, my children and I patrolled by wading all day through the forest. There was no choice as the trees were no longer the State's assets - but mine." Due to exhaustion and poor efficiency, she often felt discouraged. Ms Hoang had no experience in forest protection; thus the forest encroachers quickly learned the timetable of her family's initial patrols, and trees were poached in between them. Fortunately, forest rangers provided assistance by suggesting more effective ways to protect the mangroves. They began to frequently change both the timing and the route of their patrols. She and her two sons would begin a patrol together, but one person would be left in the forest as a sentry. If a problem was discovered, the sentry would hasten to a guard station to inform other people. When they caught forest encroachers, Ms Hoang and her children would explain the importance of the forests to the family's livelihood. She sought their empathy and understanding of shared hardships. Since the encroachers were local people who lived with the same challenges and deprivations, amicable talks and explanations proved to be more effective than threats. "With so few people protecting the forests, how can you stop the forest encroachers?" I inquired. "It was difficult at first, but my neighbour Dinh Thi Hong and I persuaded the other households associated with forest protection to help one another. We took turns in our work so that there was always someone on duty to deal with illegal encroachers. In addition, the forest rangers and police helped us to enforce the regulations. The Forest Management Board implemented educational campaigns aimed at increasing the understanding of what we were trying to achieve. As a result, forest destruction decreased considerably," Ms Hoang replied with a smile. The success of this collaborative effort in forest protection did not go unnoticed. In fact, it was singled out as an example for 57 forest-protecting families in the commune. The surrounding households adopted Ms Hoang's model, and began to help one another with new initiatives to further minimize the felling of trees. The Ministry of Agriculture and Rural Development recognized Ms Hoang's contribution with a Certificate of Merit and an award of US$20. She was cited for achievements in improving her family's living conditions and in managing and protecting the mangrove forests. The forests allocated to the Hoang family - and other forest-protecting households in the district - have become integral features of their lives. Despite its own budgetary constraints, the city government has provided considerable assistance to the forest guardians, helping them to stabilize their lives. For example, when the initial forest allocations were made, each household was given US$150 to build a guard station, and to buy a boat, earthen water containers and necessary tools. Each family was paid a regular forest protection fee and allowed to harvest and sell non-timber products; they were also given a percentage of receipts from the sale of thinnings. The government assisted households engaged in fishing and aquaculture in improving their practices. In return, the households were required to protect, manage and utilize the allocated lands and forests in accordance with the policies and regulations issued by the Management Board. To date, 167 households have been allocated 14 198 hectares of forest land in 18 Forestry Units. "In fact, the initial forest protection fee was inadequate because it provided only monthly wages to the main labourers in each family, although in most cases other people from the household were also involved," explained Mr Nguyen Khac Ngan, Director of the Department for Agriculture and Rural Development, who also heads the Management Board of Can Gio Biosphere Reserve. In subsequent years, the protection fee was calculated according to a formula based on the area being protected and topped up with additional income from the sale of thinned wood (35 to 60 percent of total proceeds). The benefits accruing to the people directly involved in forest care and protection have been improved regularly under new city regulations and as the forests have matured. As of 1999, further thinning was prohibited because all the forests had been thinned at least twice. Since this reduced the revenues of the forest protectors, the city government has increased the annual protection fee from US$4.50 per hectare to around US$20 per hectare. The living standards of the forest-protecting households are, however, still quite low. Transport is difficult due to the many rivulets and canals separating forests, and shortages of freshwater are frequent in the dry season; fresh vegetables are scarce and, until recently, the forest guardians lived without electricity. A long-held dream was realized when the city government, with assistance from local organizations including SOLARLAB (a laboratory researching solar energy) and international organizations including the Fondation Énergies pour le Monde (a French energy organization) and the Japan International Cooperation Agency, funded a solar power system to provide electricity to most of the forest-protecting households. Reserves of freshwater have also been increased with the installation of large plastic water tanks for storing rainwater; these replaced the initial earthen containers. Mobile health care boats, provided by the city government, are used to improve health care services. The Dan Xay Bridge has been constructed with state funds to facilitate transportation from Ho Chi Minh City to Can Gio District; and children from forest-protecting households are given support to attend primary and secondary schools in their local communes. The significant changes to the lives of local people have been the results of long-term and intensive efforts by various stakeholders. To ensure the development of the mangrove forests, the city government has provided preferential credit and commercial credit policies targeting inhabitants in the district, to assist them in establishing agricultural and forestry enterprises, as well as aquaculture, salt-making and other livelihood opportunities. Improved livelihoods for local people mean reduced pressures on the mangrove forests. With alternative means of income generation and new energy sources, local people no longer cut down mangroves. Education and training provided by government technical staff have enabled local people to establish new industries, such as aquaculture, and gain higher outputs without affecting the mangrove environment. For example, the use of tidal flats in front of the mangroves for clam and blood oyster farming has significantly reduced poverty in Can Gio. Elsewhere, the city government has granted interest-free loans for planting nypa palm (Nypa fruticans). The Flemish Organization for Assistance in Development, a Belgian non-governmental organization, has supported remedial treatment of salinated agricultural land and mangrove planting. I was surprised to find Ms Hoang living in a spacious new home with modern amenities including a television, cassette recorder and motorbike. She has also been able to build separate houses for her eldest son and her third son. This was a marked change from just a few years earlier. Observing my astonishment, Ms Hoang laughed, "You're surprised, aren't you? To be frank, the wage paid by the government is only enough for daily needs. Our family is now involved in many other activities. We don't want the hard-earned money from our days of wading and planting in the mud and protecting the forests to sit idle in the bank." "I considered various options, but after reading a newspaper article on the topic, I started rearing crabs in river cages. I obtained technical help from the District Fishery Department. After only 30 days of rearing, female crabs grow sufficiently to sell for US$6 per kilogram. Merchants from Ho Chi Minh City come here to buy them for export, so I don't have to go out to sell them. After nine continuous rounds of crab rearing in three years, I've earned US$900 profit." Hard-working people like Ms Hoang no longer fear poverty. She is also very active and full of energy - more than many men of her age. "What about sea eel farming? Have you been involved in this?" I asked. "Well, things do not always go smoothly, you know. Our plans to raise sea eels failed after the first harvest, because of oil spills that killed the eels," she replied. Noticing the chickens outside scratching for food in the garden, I asked, "I was told that you had been raising goats. Where are they now?" "Goat raising is very profitable. We started with three goats in 1991. By 1996, we had 31 goats. But, we did not have sufficient people to look after them, so the goats regularly escaped - destroying our neighbours' crops. I had to sell them to my brother," she reported sadly. "Like other local people in this area, I now rear pigs, chickens and ducks, which do not destroy the surroundings. These animals also help us to lower our bills for feed. We use chicken manure as feed for cultured fish. With income from both the animals and fish, we're very happy." "I've also been farming shrimps for more than a year now. But, unlike people in other areas, my neighbours and I have not cut down mangrove forests for shrimp farming. My shrimp pond is 2 000 square metres, dug in an area where there were no mangroves. Training courses organized by the Management Board have helped us to understand the importance of mangroves. Without the forests, the land on which we are living and building our assets would be eroded. No longer would we be able to raise shrimp, crabs, oysters and other shellfish, because there would be no detritus for them to live on. The soil becomes acidic and cannot be used for cultivation or rearing at all. And we cannot simply destroy our own efforts spent during years of protecting our forests." All these activities have not sapped Ms Hoang's energy. In 2000, after teaching herself about mangrove seedling nursery techniques, she signed a contract with the Management Board to establish nurseries of Intsia bijuga, Thespesia populnea and Xylocarpus granatum - three tree species that produce highly valued wood for handicrafts and furniture. This task is considered extremely difficult - even for technical forestry staff. When thinning was no longer permitted in the Can Gio forests, Ms Hoang and several other people bought thinned products from neighbouring provinces and sold these as construction materials and fuelwood. Recently, she has earned around US$200 from harvesting nypa palm leaves, used for thatching roofs. Free time is not a familiar concept among Ms Hoang and her family. In 1991, to make full use of unproductive areas, they collected Rhizophora propagules and planted them on 120 hectares of bare land. Ten years later, the city government issued a policy to buy back this type of land to expand the rehabilitated mangrove area. The city has subsequently purchased an additional 988 hectares, for US$3.6 million, to expand the Can Gio Biosphere Reserve. 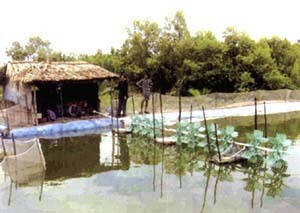 The Hoang family's 2000 m2 semi-intensive shrimp pond(courtesy Vien Ngoc Nam). The success of Ms Hoang's family illustrates the effectiveness of combining mangrove planting, protection and the development of complementary enterprises. Starting with their bare hands, they now have capital for development and stable income. Ms Hoang notes that such achievements came not only from her family's hard work, but also as a result of assistance given by the staff of the Management Board. She also cites leadership at the city level and social organizations at home and abroad. Nypa palm leaves provide considerable income for Hoang's family (courtesy Vien Ngoc Nam). A preliminary evaluation of community participation in mangrove management following mangrove land allocation in Can Gio has been carried out by the Agriculture and Forestry University of Ho Chi Minh City in cooperation with the Department of Agriculture and Rural Development. The evaluation showed that not only have mangrove forests been well protected but local livelihoods have been stabilized as well. Payment of mangrove protection fees is sufficient only for daily meals, but supplementary enterprises have helped people to improve their living standards considerably. 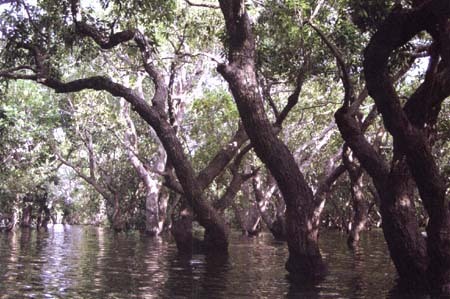 It is clear that the successful management of mangroves in Can Gio is attributable not only to payment for mangrove protection, but also to empowering measures including provision of secure land tenure, assistance to local people in establishing homes and settlements and support for the development of viable enterprises associated with mangroves. The very existence of the Can Gio mangrove forests is a testimony to the 25 years of effort and creativeness of the authorities and people of Ho Chi Minh City and Can Gio. Observing the immense mangrove forest stretching along the waterways spreading out to the six communes - extending to estuarine mud flats and islets in Can Gio - it is hard to believe that the area was once largely barren land. Can Gio mangrove forests, including the mangroves of the Hoang family, have become a source of great pride to the local people and authorities, especially since they have been designated as a World Biosphere Reserve. Educational materials distributed by the Mangrove Ecosystem Research Centre, various extension activities conducted by the city and nearly 100 training courses funded by UNESCO, have made local inhabitants fully aware of the major significance of Can Gio mangroves. They now proudly demonstrate to visitors from different parts in the world, how the mangrove forests are being protected and rehabilitated. Today, Can Gio contributes to the conservation of the full biodiversity spectrum, including landscape values, ecosystems, species and genetic resources. It has also fostered economic and human development, taking account of sociocultural and ecological sensitivities. Support is provided for research, monitoring, education and information exchange relating to local, national and global issues of conservation and development. Can Gio has also become an important tourist destination and a research site for students and scientists. To facilitate these developments, Action for Mangrove Reforestation (ACTMANG), a Japanese non-governmental organization, and TIERRA, a Japanese enterprise active in environmental education, have funded the construction of five seminar/training centres in the mangrove area. The centres provide opportunities for people to interact and immerse themselves in the diversified mangrove ecosystem. Meanwhile, Ms Hoang's family now employs seven labourers. Her eldest and youngest sons are both busy working in a motor repair shop in the centre of Tam Thon Hiep commune, but still help their mother in protecting mangroves at times. Her third son is a staff member of the Management Board. Her fourth son and his wife follow her example, protecting the mangroves. Although she is already 55, Ms Hoang is still busy managing her increasingly large assets. In a picture taken at the wedding of her fourth son, she wore a big smile but still had mud on her feet. The mangroves have closed their canopy, and their strong roots have penetrated deeply and firmly into the mud. Yet Ms Hoang and her neighbours continue doing their silent work - protecting and rehabilitating the mangroves for the benefit of their families and many others for generations to come. An, N.T.N. 1998. Economic analysis of the household involved in the management plan of mangrove forest in Can Gio District, Ho Chi Minh City. In P.N. Hong & P.A. Dao, eds. Proceedings of the national workshop "Socio-economic status of women in coastal mangrove areas - Trends to improve their life and environment," Hanoi, 31 October to 4 November 1997. Agricultural Publishing House, Hanoi: 151-158. Cuong, N.D. 1994. Management and protection of mangrove forests at Can Gio, Ho Chi Minh City. In P.N. Hong & P.A. Dao, eds. Proceedings of the national workshop "Reforestation and afforestation of mangroves in Vietnam," Can Gio, Ho Chi Minh City, 6-8 August 1994. MERC: 42-43. Cuong, N.D. 1996. The result of planting, taking care, protecting and developing Can Gio mangrove forests (1978-1995). In P.N. Hong, ed. Proceedings of the national workshop: "The relationship between mangrove reforestation and coastal aquaculture in Vietnam," 31 October to 2 November 1996. Agricultural Publishing House, Hanoi: 54-57. Hoang, N.K. 1996. Preliminary achievement of Ms Nguyen Kim Hoang's household in the Can Gio protective forest allocation for protection program. In P.N. Hong & P.A. Dao, eds. Proceedings of the national workshop "The relationship between mangrove reforestation and coastal aquaculture in Vietnam," Hue City 31 October to 2 November 1996. Agricultural Publishing House, Hanoi: 214-218. Hong, P.N. 1996. Restoration of mangrove ecosystems in Vietnam: A case study of Can Gio District, Ho Chi Minh City. In C. Field, ed., Restoration of mangrove ecosystems. The International Tropical Timber Organization (ITTO) and the International Society for Mangrove Ecosystems (ISME), 76-79. Hong, P.N., Tuan, L.D. & Nhuong, D.V. 1996. Effects of rehabilitation of mangroves on the environment and biodiversity in Can Gio District, Ho Chi Minh City. In Environmental assessment of mangrove reforestation as a means of improving coastal protection, stability and fisheries production. Second project planning meeting. Life Sciences and Technologies for the Commission of the European Union Hanoi, 27-28 March 1996. pp. 18-28. Sinh, L.V. 2000. Eco-tourism in Can Gio, Ho Chi Minh City - Current status and solutions for further development. In P.N. Hong et al., eds. Proceedings of the scientific workshop: "Management and sustainable use of natural resources and environment in coastal wetlands," Hanoi, 1-3 Nov. 1999. Agricultural Publishing House, Hanoi: 148-153. Phan Nguyen Hong has been involved in mangrove ecosystem research for more than 35 years. He is the author of several books on mangrove ecology and management published in Vietnamese and English, as well as texts on biology published in Vietnamese. He holds a number of degrees in ecology including a Ph.D. obtained in 1970 and, most recently a Doctor of Science (1991). Currently, he is a Professor of Ecology at Hanoi University of Education and Director of the Mangrove Ecosystem Research Division, Centre for Natural Resources and Environmental Studies, Viet Nam National University, Hanoi. The author would like to extend his sincere thanks to Ms Nguyen Kim Hoang, Dr Vien Ngoc Nam and Le Duc Tuan M.Sc. for supplying some of the information used in this case study. Suprava Patnaik very three days, Saila wakes very early in the morning and walks to the nearby forest to gather mushrooms and medicinal leaves, which she sells at the local market. On afternoons, during authorized periods, her neighbour Champaka also goes to the forest to collect branches and twigs to be used as fuelwood. Some days she finds nuts or berries that she collects and brings home for her family. Both of them try to protect the forest. "To us, the forest means life itself. Without the forest, our lives here would no longer be viable," said Champaka, a farmer's wife. "It is the source of our livelihoods. We get fuelwood and building materials from the forest - even our water and medicines. This is the reason why we take care of our forest," added Saila, a mother of three. It is not a new phenomenon for communities to be protecting forests in India. Local people have protected various sites and species for centuries throughout the country. Even now - with forest protection high on the national agenda - some of the best protected forests are the "sacred groves" guarded and nurtured by traditional communities. In some parts of India, community institutions have initiated protection and management of forests - independently of government programmes. This generally occurs because the communities concerned are economically dependent on forest resources, for either subsistence or income. Presently, there are several thousand of these self-initiated community forests. The State of Orissa, situated in the eastern part of India, has a long tradition of community-led forest conservation and management. Efforts began as early as 1936, in Lapanga Village of Sambalpur District, and gathered momentum in the late 1970s becoming a widespread trend in subsequent years (Vasundhara 2000). Currently, an estimated 8 000 village groups in Orissa are protecting approximately 2 million hectares of forest (Pattanaik 2002). Forest protection has usually been initiated in response to a scarcity of forest products resulting from forest degradation. Such efforts have emerged as village-based initiatives, without the support of the government, and are successfully protecting degraded or partially degraded stands in reserved and protected forests (Box 1). Communities generally begin by developing various institutional rules and directives, such as regulations covering extraction and distribution of forest products and penalties to be applied to offenders. Direct forest protection mechanisms vary, but typically include voluntary rotational patrolling or employment of paid watchers. The Indian Forest Act of 1927 legally designates government forests into three categories that offer graduated degrees of protection. The greatest protection is afforded to reserved forests, in which only activities that are specifically permitted may be carried out. Conversely, in protected forests, a more limited degree of protection is provided. In practice any activity is allowed unless specifically prohibited. A third forest classification, unclassed forests, comprises forest land owned by the government, but not constituting a reserved or protected forest. There are fewer restrictions for unclassed forests as compared to reserved and protected forests. Nayagarh District, which houses 864 000 people, is located in the eastern part of the State of Orissa. With a total area of 424 200 hectares, the district has an undulating topography with a broken mountain system intersected by plains, valleys and streams. Forest areas in Nayagarh District cover approximately 220 800 hectares and contain a range of forest types including semi-evergreen, moist mixed deciduous, riverine, moist peninsular sal (Shorea robusta) forest, and dry mixed deciduous forest. The Forest Survey of India notes that approximately 63 percent of the district's forest areas possesses a canopy density greater than 40 percent closure. Community protection of forests in Nayagarh District began in the late 1960s, but gained momentum only in the 1970s. The process was further strengthened in 1982, with the emergence of a voluntary organization - Brikshya O' Jeevar Bandhu Parishad (BOJBP) - which formed when 22 villages situated around the Binjhagiri and Malati hills united to protect forests on these degraded uplands under the leadership of a group of schoolteachers and respected leaders in the village. Both hills were heavily deforested and streams originating in the hills were drying up. The surrounding villages faced fuelwood scarcity, shortages of water and increased soil erosion (Kant et al. 1991). The BOJBP provided a sound model for forest protection that was adopted by many villages in the district. Today, several hundred community forest management organizations have sprouted in Nayagarh District to protect forest resources in the district's three principal protected and reserved forests - Sulia, Ratnamala and Hatimunda. To date, 750 villages have united to form the Nayagarh Jangal Surakhya Mahasangha - a district-level forest protection federation. Sulia Reserve Forest extends over 6 324 hectares and is one of three important reserve forests in Nayagarh District. It encompasses three forest ranges: Nayagarh (1 780 hectares), Mahipur (1 604 hectares) and Odogaon (2 940 hectares). The Sulia hill range starts near Machipada, which is about five kilometres south of the town of Nayagarh. The majority of villagers living on the fringes of Sulia Reserve Forest either farm marginal smallholdings or are landless labourers. They are highly dependent on the forest for fuelwood, timber for housing construction and repairs, poles for fencing and for making platforms for stacking paddy and bamboo for a variety of utilitarian purposes. Non-timber forest products harvested from the forest include nuts, berries, leaves of sal (Shorea robusta), siali (Bauhinia vahili), harida (Terminalia chebula), bahida (Terminalia belerica) and several other medicinal plants. "Compared with other reserve forests in the district," explained an Odogaon forest range officer, "the pressure on Sulia Reserve Forest is very high because it is very near to Nayagarh town and is surrounded by several large villages." Satyabadi Mohapatro, from Machipada Village, recalled that in the past Sulia reserve had good forest cover. "It started to lose its forests when uncontrolled demand for timber from nearby towns and cities was coupled with unrestricted cutting of fuelwood and poles by the surrounding villagers." In a relatively short period, the villagers living near Sulia Reserve Forest realized that if they did not protect the forest, their sources of livelihood would be gone. "The forest resources were diminishing," remembered Chaitanya Prasad Barad, a retired teacher and resident of Solapatta. "The degraded Sulia hill barely had any trees. We could only see stones and had great difficulty in obtaining fuelwood, timber and bamboo." He recalled that the shortages were so acute that villagers had to get up early in the morning to travel the 10 to 13 kilometres to Ratnamala forest, to collect a cartload of fuelwood and other forest products. It was a laborious task - especially the return journey - carrying bundles of wood, and it demanded urgent action. "Instead of going to other areas to collect fuelwood and timber, why don't we protect our own forest?" they asked themselves. In 1989, the late Shri Raghunath Pradhan, a respected social leader of Magarbandh Village, and a youth group working in adjoining villages, motivated the villagers to band together to form the Sulia Paribesh Parishad. Over the years, villages around Sulia Reserve Forest organized individual (village-level) forest protection committees to protect specific patches of forest or, in some instances, clusters of villages have formed joint committees to protect large forest compartments. The largest joint committee encompasses 36 villages. Today, the committees have coalesced into 14 forest protection groups. Some of these groups have organized themselves into regional committees to ensure better coordination of protection work. One such regional committee is the Sulia Paribesh Parishad, a group of 18 villages. These villages comprise more than 12 000 people of mixed professions and ethnic backgrounds. The village nearest to the forest is less than 3 kilometres away, while the farthest is about 10 kilometres distant. The villagers estimate the total area protected by the Sulia Paribesh Parishad to be approximately 1 400 hectares, covered with mixed deciduous forest. With objectives including forest protection and sustainable forest management, the Sulia Paribesh Parishad has established clear guidelines for collecting and distributing forest products, protecting forests, granting access, fixing prices for different products and imposing fines and penalties. The rules take into consideration the various sectors of society and emphasize equal participation in terms of representation, and transparency in information sharing and subsequent decision making. The fundamental guiding principles of the Sulia Paribesh Parishad are based on democratic decision making, clear and flexible rules and location-specific management practices, founded on a rich base of traditional knowledge. The decision making process for the Sulia Paribesh Parishad is managed by village bodies, a general body and an executive committee. Village bodies consist of a man and a woman from each household. Each village sends a minimum of five representatives (including at least two women) to a cluster general body, which in turn elects the executive committee including the office bearers (president, vice-president, secretary and treasurer). The president and the secretary are the chief functionaries. The executive committee has 82 members (26 are women), with the remainder representing various tribes and castes. The general body convenes once each year, while the executive committee meets on a monthly basis. An informal core committee of 10 to 12 members advises the executive committee regarding the functions of the Sulia Paribesh Parishad. Emergency meetings may be conducted at any time to address a particular issue. A good example occurred recently in Jiripada, a tribal village situated near Sulia Reserve Forest. One of the villagers felled trees illegally to make farming tools. The executive committee called an emergency meeting to deal with the situation. The person involved was summoned before the meeting and cautioned. The committee also confiscated the farming tools and fined him. During executive committee meetings, various forest development and management activities are discussed. A regular agenda item is the organization's balance sheet. "Our organization believes in transparency," explained Sri Subhas Chandra Sahu, the current secretary. "Our accounts are audited and the income and expenditure statements are always reported during meetings." The Sulia Paribesh Parishad mobilizes financial resources from various sources, with base funding coming from household contributions known as chulichanda (chuli means "stove" or "hearth" while chanda means "subscription"; in India, a joint family may have as many as 15 to 20 members constituting one household using a common stove or chuli). Members usually contribute US$0.09 per year as chulichanda. Other major revenue sources include charges levied for forest products collected during the annual thinning and harvest operations, auctioning of wind-thrown trees and seized products and fines. Principal expenditures are for forest management activities, salaries for paid watchers, networking and various community activities. Once these decisions have been made, they are announced to the villages. One member is identified in each village to issue entry passes and receipts. After paying the stipulated fee, villagers are issued a receipt and an entry pass. Checkpoints are set up and bullock carts are prevented from passing the checkpoints. Forest products are collected and carried manually by headloaders to checkpoints. This helps to eliminate pilferage of timber and other products. Cleaning, thinning and harvesting operations are generally carried out over a three- to five-day period each year. Household collection quotas for various products may vary year to year depending on the demand-supply situation. Generally, each household is allowed 2 to 5 cartloads of thinning materials for fuelwood, 40 pieces of bamboo, 40 bamboo twigs (kanika) and 40 poles. A nominal price is charged for each of these forest products. For example, US$0.22 is charged for 40 pieces of bamboo, while one headload of fuelwood costs US$0.04. The protection and management of the forest is regulated according to rules on collection and utilization of various forest products. Collection of non-timber forest products is not restricted, while grazing was initially restricted for three years after the commencement of protection (1991-1993) to facilitate forest regeneration. Timber harvesting for the construction and repair of houses and agricultural implements is allowed for subsistence needs - but only after receiving properly submitted details of requirements. The executive committee assesses each application for approval, after which the member may collect the timber on payment of the stipulated price. However, there are special restrictions regarding cutting of important trees such as sal, mahua (Madhuca latifolia), tendu (Diospyros melanoxylon), asan (Terminalia tomentosa), jamun (Syzygium cumini), siris (Albizzia lebbeck) and bandhan (Ougeinia oojeinsis). In special circumstances, non-members are also permitted to harvest timber; for example, to repair or rebuild houses damaged by natural calamities (cyclones or fires) or for religious and funeral ceremonies. The committee may approve non-member harvesting only after verifying the need and strength of an applicant's request. Sometimes, permission for timber harvesting is also allowed for community activities such as building schools, temples and community halls. Thengapalli is an amalgam of thenga meaning "stick" and palli for "rotational turn." Thengapalli is a traditional system of stick rotation whereby a thenga is placed in front of the house of the person who is responsible for patrolling the forest on a particular day. At the end of the day, he leaves the thenga outside his neighbour's door, who assumes patrolling responsibilities the next day. During the first six years of protection operations (1991-1996), the method of protection was thengapalli. For the first three years, four people patrolled daily, but in the following three years the number was reduced to two persons. By the seventh year, when it was perceived that the threat to the forest was less immediate, two watchers were hired at US$26.66/month. Although the paid watchers were responsible for the overall protection of the forest, the villagers also remained vigilant against threats. A "mobile committee" was established to supervise overall protection aspects of the forest (including supervising the work of the paid watchers). When a theft occurs, or is anticipated, the villagers assist the paid watchers. For example, on one occasion a group of villagers received news that some bamboo artisans from an adjacent village (non-members of the Sulia Paribesh Parishad) were planning to raid the forest for bamboo poles. The villagers once again implemented thengapalli patrols to support the paid watchers until the planned raid was abandoned. The committees have established informal rules and penalty systems to curb offenders (Table 2). The executive committee has fixed monetary fines according to the quantity (headload/cartload), species (permitted and non-permitted species) and type of tree (pole-sized tree or small timber) that are harvested without permission. Seized materials are generally auctioned, with the money generated (along with fines collected) being treated as a community resource. The forest management systems being practised by the Sulia Paribesh Parishad are location-specific, needs-based and centered on traditional knowledge. For example, bamboo is not harvested between May and September because this is the time new shoots emerge. During the harvesting period, bamboo poles are not cut off at ground level. Rather, harvesters leave a length of two internodes (about 35 centimetres) to prevent rainwater damage to the rhizome. Some specific management practices are followed for certain species and forest products. Permission to harvest particular species depends on the availability and abundance of the species. Before the annual timber-harvesting quotas are granted, committee members survey potential harvesting areas. They monitor the composition and condition of the forest and only those areas that are deemed to have sufficient growing stock are opened for extraction. The estimation is based on visual assessment and experience. Species that are specified for fuelwood are usually of lesser value. Local demand for poles of karada (Cleistanthus collinus) for medha is very high. As such, harvesting of karada species is allowed only every third year. This species is managed for short rotations and coppice shoots are harvested. In cases where demand exceeds supply, harvesting of karada species is controlled and harvesting of other species may be allowed to meet demand. In 1996 and 1997, thinning, climber cutting and enrichment planting were conducted under a World Bank-aided Integrated Watershed Development Project. Enrichment planting was carried out with approximately 25 000 saplings of Eucalyptus spp., Acacia auriculoformis and Cassia siamia initially, followed by 10 000 supplementary saplings planted the following year as casualty replacements. As an organization, the Sulia Paribesh Parishad has matured significantly over the past decade. It is one of the most active members of the Jangal Surakshya Mahasangha (the district-level forest protection federation) and it takes an active role in various issues related to community forest management. The executive members of the Sulia Paribesh Parishad are aware of various legal and policy issues relating to management of the forest and are receiving training in conflict resolution through workshops and meetings conducted by the Jangal Surakshya Mahasangha. Interestingly, the forest protection efforts of many community forest management groups including the Sulia Paribesh Parishad are not formally recognized by the Orissa Forest Department within its Joint Forest Management programme. For the most part, local forest department staff are appreciative of the efforts of the community in protecting the forest. Ironically however, many of the products harvested - including timber, poles and bamboo - officially require departmental approval and so, strictly speaking, almost all of the harvesting does not have legal approval (Box 2). "...without waiting for supportive policies and judicial decisions, since the 1940s and 1950s, thousands of communities started forming community forest management groups to protect their local forests, primarily in eastern India's tribal forest tracts. Village communities in West Bengal, Bihar and Orissa began responding to the environmental crisis as they watched the once densely forested hills and plains being denuded... The states of Orissa and West Bengal ratified guidelines for joint forest management in 1988 and 1989, respectively. This enabled local communities living in and adjacent to forest areas to manage public forests. Recognizing the Forest Department's own ineffectual attempts at forest protection, and the need and growing political pressure to include local communities in forest protection activities, the Government of India passed an Order in 1990 that solicited people's participation in joint forest management ventures honoring community rights to collect fuelwood, timber, fodder and non-timber forest produce collection from public forest areas they organize to safeguard." The local forest department staff are motivating many of the community forest management groups to form Vana Samrakhyana Samiti and bring their management operations for mally under the government's Joint Forest Management programme. Already, even without formal recognition of the Sulia Paribesh Parishad, local forest department staff are often asked to help resolve conflicts regarding boundary issues or illegal harvesting by outsiders. Generally, the forest department staff provide helpful assistance in resolving the issues and disputes. After more than a decade of forest protection, Sulia Reserve Forest has been at least partially restored to its former glory. The regenerating forest can now provide a steady supply of forest products to the community. The subsistence needs of the local people are being met and distribution of forest products from thinning and cleaning operations are benefiting all segments of society. The most vulnerable people in the community - especially fuelwood collectors - have particularly benefited as they can gather a steady supply of fuelwood for a token fee. Protection is the critical issue that has united the community to work towards a common goal. Forest protection interests have served to foster solidarity within the Sulia Paribesh Parishad and among community forest management groups at various levels. Community members take pride in describing the forest as amo jangal ("our forest"). They have grown confident in their actions and empowered in speaking out on issues that affect the forest that they have been protecting for more than a decade. Forest Survey of India. 2000. State of forest report 1999. Kant, S.; Singh, N.M. & Singh, K.K. 1991. Community based forest management system (case studies from Orissa). Indian Institute of Forest Management, Bhopal; Swedish International Development authority, New Delhi; and ISO SwedForest, New Delhi. Panda, B.B. 2000. The real forester. Community Forestry (1): 3 & 4. Pattanaik, M. 2002. Community forest management in Orissa. Community Forestry (1): 1 & 2. Ravindranath, N.H.; Murali, K.S. & Malhotra, K.C. 2000. Joint forest management and community forestry in India: An ecological and institutional assessment. Oxford & IBH Publishing Co. Pvt. Ltd.
Vasundhara. 2002. Need to look beyond JFM: learnings from community forest management in Orissa. Banabarta, Issue 1. Dr Suprava Patnaik is an assistant professor at the Indian Institute of Forest Management, in Bhopal, India. Her major research interests include community-based natural resource management, gender and development, biodiversity conservation and sustainable livelihoods. Community Resource Committees protect flooded forest near Kompong Phluk, Cambodia (courtesy Sasha Constable). 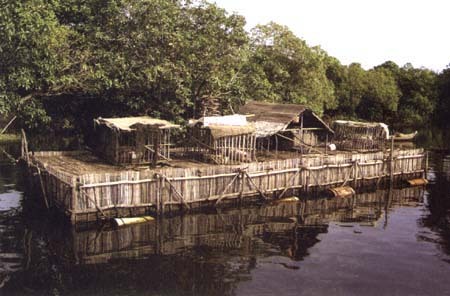 Cage culture of pangasius catfish and pigs in Kompong Phluk (courtesy Sasha Constable). "I have been fishing in the flooded forests of Kompong Phluk all my life," said Las Hart, a local gillnet fisher. "Although fishing can be hard, because people sometimes steal my nets and gasoline is expensive, I love fishing these flooded forests." Like most Cambodians living in rural areas (about 84 percent of the population), Las Hart is highly dependent on natural resources. "We rely on fish and forests for our livelihood," Hart noted. Kompong Phluk lies on the shores of Tonle Sap Great Lake, one of the largest freshwater flood plains in the world. At its lowest water level in May, Tonle Sap covers an area of 250 000 hectares. However, with the arrival of the monsoon in June, the Mekong River rises and the Tonle Sap River (which drains the Great Lake during the dry season) reverses its flow and expands the lake to cover more than one million hectares by the time the monsoon ends several months later. Almost half of the vast flood plain is covered by what is termed "flooded forest" - a mosaic of forest and brush lands. The local vegetation is uniquely adapted to this annual flood cycle, whereby trees and other plants spend four or five months submerged beneath metres of water, patiently waiting for the sun to return. Common tree species of flooded forests include Barringtonia acutangula, Diospyros cambodiana and Coccoceras anisopodum. Most of the trees and plants shed their leaves when the water rises, which adds organic matter to the lake and subsequently stimulates phytoplankton and zoo-plankton production, thereby boosting fish productivity. This unique cycle is the foundation of an exceptionally productive ecosystem for fish and wildlife. The flooded forests protect the core of the Great Lake during the dry season, and act as an immense fish hatchery during the wet season. They are, consequently, critical to sustaining the aquatic ecology of the Great Lake. Local fisheries contribute a considerable proportion of daily protein requirements for the villagers of the Tonle Sap area, and are a key resource for the rural people. Continued access to fisheries and forest resources is vital for food security and sustainable livelihoods, especially to people with little or no land. However, access to these resources by the rural population has become precarious, especially since the early 1990s. Cambodia's once rich base of natural resources is being rapidly depleted, with the past decade being particularly damaging to the country's forest and fisheries resources. Reasons for this disturbing decline include use of illegal fishing gear, overharvesting of natural resources and widespread forest clearing. Twenty-five years ago, forests covered nearly three-quarters of Cambodia's land area. The latest estimates, however, indicate that the country's forests have shrunk to only 9.3 million hectares, or only about half the land area. The unique flooded forests have been particularly devastated, declining from more than 900 000 hectares in 1973, to less than half a million hectares at present. The fertile soil and flat topography of the flooded forest region make it attractive for farming, and clearing continues today with farmers seeking land for dry season rice, watermelons, mung beans and other vegetables. The fishery resources of the Great Lake have been under similar intense pressure, especially during the 1990s. Fisheries on the lake were managed under a concession (fishing lot) system originally established during the French colonial period, approximately 100 years ago. Although the system was designed to maintain fish stocks at healthy levels, actual implementation of the system encouraged holders of fishing lots to extract maximum quantities of fish. Fishing lots were jealously guarded via intimidation and violence, and lots were progressively expanded at the expense of small-scale local fisherfolk. Rising discontent over the inequitable fishing lot system led to its abolition in many parts of the Tonle Sap Great Lake in early 2001, throwing fisheries resources open to all users. In the initial three months following the abolition of the fishing lot system, intensive exploitation of the fishery resources occurred. "The wealthy fishers and powerful business persons benefited the most, while the poor fishing communities watched their resources being stripped before their eyes," wrote Patrick Evans, Chief Technical Adviser of the FAO-supported Participatory Natural Resources Management in the Tonle Sap Project, in a recent article featured in the fisheries periodical SAMUDRA. Although the initial "free-for-all" situation following the abolition of the fishing lot system resulted in rapid depletion of resources, it also created an enabling environment for reform, as local fisherfolk demanded assistance in establishing control over the local resources. Gradually, local communities have gained increased access and control over large areas of Tonle Sap. Responding to destructive and inequitable resource exploitation, some communities began to organize themselves to find ways of protecting and better managing their resources. Several communities have demonstrated that destructive environmental practices near their community can be successfully curbed through active participation in resource management. Two such communities are Kompong Phluk Commune and Bos Thom Village - both in Siem Reap Province. The experiences of these two communities highlight the potential for community-based management as a means of protecting and managing natural resources in the Cambodian context. In both localities, people are heavily dependent on natural resources. In Kompong Phluk, people rely on the flooded forests to protect their homes from wind and storms and as bountiful fishing grounds, while in Bos Thom, people rely on the upland forests for income-generating activities and for crop production. Both communities receive support from the Participatory Natural Resources Management in the Tonle Sap Project, implemented by the Government of Cambodia in collaboration with FAO and the Government of Belgium. Kompong Phluk Commune, comprising three villages, has a long history of local resource management. The commune has been practising community-based management since the 1940s, and is perhaps one of the oldest examples of community forestry management in Cambodia. Many of the older people recall that as children they learned about the importance of forest protection from village elders. The small size of Kompong Phluk (currently 434 households) and the relatively large number of people that returned to the area at the end of the Khmer Rouge regime appear to have assisted the retention of traditional knowledge and practices in the commune. "Old people knew," said Ros Norn, an elder and committee member in Kompong Phluk. "They knew a lot. Old people knew that fish lived in the [flooded] forest... and that the forest helps to protect the village - especially in the flood season - from water, waves and storms. Protecting the [flooded] forest meant that they were protecting the fish-breeding grounds. This meant that there would be enough food." Commune elders remember working together to find a common strategy for resource management. Motivated to protect their homes from storms and winds, they agreed to stop the farming of watermelons near their villages in the late 1940s and to let the area naturally regenerate into forests. The regenerated forests not only helped to protect their homes from storms and winds, but also provided an important fish habitat. Villagers were motivated to continue these forest protection practices, especially near their villages. The former watermelon patch is now a dense forest that surrounds the commune. In the late 1980s, an administrative reorganization resulted in Kompong Phluk farmers having their mung bean fields allocated to other communes. Subsequently, upland farmers encroached steadily on flooded forest areas. These developments, together with population growth, resettlement of former Khmer Rouge cadres, limited access to natural resources and widespread overfishing led the community to "rethink" its natural resource management strategies. This rethinking started, in part, as a response to the encroachment problem, and also to take advantage of working with a new FAO project that began operating in Siem Reap in the mid-1990s. Historically, flooded forest protection was achieved through informal local management mechanisms such as oral agreements, with support from the local government. It was only in the late 1990s that these traditional resource management processes - and the rules and regulations that were framed by the community resource committee - were formalized, with support from the FAO project. "We began working on flooded forest protection since that is what we knew best," recalled Sok Plan, who was elected as the chief of the community resource management committee in 1999. Initially, an area of 927 hectares was identified for community management in Kompong Phluk, but this area was expanded markedly in 2001 to encompass more than 14 000 hectares. The Kompong Phluk Community Resource Management Committee is instrumental in establishing roles and responsibilities for resource management in the commune and in developing a management plan for the flooded forest and fishery resources. This committee is elected every three years at a public meeting, with the participation of all stakeholders: local communities, commune council members, relevant provincial government officers, and a representative from the governor's office. Nine villagers (three per village) make up the central committee. Subcommittees, with specific responsibilities for patrolling, extension and finance, are formed subsequently. coordinating with national and international organizations to gain support for rural development activities in the commune. "Long before the community (Community Resources Management Committee) was set up, people loved and took care of the forest," said Tep Pheoro, a Kompong Phluk committee member. "It was not perfectly managed, though, especially in recent times. So, it was good timing for the FAO project to come here - for them to help us. We wanted to stop the mung bean farming, which started in 1993, near our commune." protecting birds and other wildlife. The committee meets once a month to review progress and to resolve any obstacles. The committee's annual programmes and budgets for the ensuing year are presented and approved, following in-depth discussions, at a meeting attended by a quorum of resource users and stakeholders. Regular extension meetings provide opportunities for monitoring of progress and listening to feedback from resource-users. The management plan for the community's flooded forest guides the community in managing the forest and fishery resources in a prescribed manner to ensure sustainable use of the resources, without impairing the environment. The plan also defines the organizational structure of committees, the roles and responsibilities of committee members and community residents, actions permitted and prohibited in the flooded forests and the fines and penalties to be imposed. Clearing of any flooded forest area is completely prohibited - as is hunting or trapping wild animals, and the use of illegal fishing equipment. The current plan is being updated to include both forestry and fishery resources, and to redefine community boundaries for resource management. "Since our commune is small, we easily work together," observed Sok Plan. "Each village is responsible for protecting a part of the forest. However, all of us are responsible for protecting the forest near the village." The community resource committee in Kompong Phluk has been working together for several years now, exploring different management options and strategies. While the committee recognizes that not all the issues can be tackled at once, they believe that they can solve many of the challenges by themselves - and with support from the FAO project, the more difficult ones can also be resolved. For instance, in addressing the encroachment issues arising from the boom in mung bean farming, the committee worked with provincial authorities and the FAO project to stabilize the situation. The committee also took a firm stand with district officials, demanding that measures against further land encroachment be enforced. "I feel good about working with the committee," remarked Sam Norn, a volunteer in the enforcement section of the committee. "I enjoy my work and know that it will help my children. Whenever I have free time, I try to help the committee with patrolling activities." All committee members are volunteers; the fact that no salaries are paid demonstrates that the villagers have great faith in the work of the committee. Through education and extension, the committee has stopped the cutting of fuelwood in mature forests. Collection of fuelwood is now confined to designated areas and to the gathering of driftwood. To alleviate the problem of declining fishery resources, the committee created a kilometre-square fish sanctuary and conducts regular patrolling to combat the use of illegal fishing equipment. The villagers have adopted a combination of strategies - from protection to changing fishing practices - to ensure that the flooded forest and fishery resources are protected. However, the committee is realistic about what they can and cannot tackle, and is trying to devise systems that make best use of their capacities. Several committee members explained how they react when illegal activities are reported. "After the report from a commune member, the committee quickly moves to confront the offenders and warns them. We try to explain our reasons for protecting the area and establishing rules. On the second and third offense, we fine them. But some have no money as they are poor people who live far away. In that case we let them go." This attitude highlights the awareness of the committee of the fundamental reasons for continuing resource destruction and sensitivity toward poor families that are simply trying to survive. Striking a balance between strict enforcement and moral persuasion is crucial to their work. It was only in December 2003 that the Cambodian Government adopted, after a lengthy process, a subdecree on community forest management, giving communities the security of tenure required to implement comprehensive measures for sustainable resource management. Hence, it is even more impressive that these community initiatives have been progressing since as early as 1940, despite the legal vacuum, indicating the high level of confidence in community approaches towards natural resources management. While forestry legislation has been enacted recently, legislation for community fisheries is long overdue. "By the time they issue the law, there will be no fish left," commented Ou Ngeoum, another committee member, when asked if government policy could help local fisherfolk. Although the provincial forestry and fisheries departments and the Siem Reap governor support community forestry, the committee recognizes that they need more support from the government if their activities are to be sustainable in the future. "We need technical departments to help us to better manage our resources, especially for patrolling activities and enforcement," said Ou Ngeoum. Bos Thom Village is more distant from the Great Lake, located close to evergreen forests of the upper watershed. But, its experiences provide additional insights into community-based forest management in Cambodia. "By protecting our forests, we are benefiting from increased wildlife, clean fresh water and regeneration of tree species. People have a place where they can harvest fruits and traditional forest products," said the chief of the Bos Thom community forest committee. Bos Thom is somewhat different from Kompong Phluk. It is a small village, consisting of 72 households that collectively protect and manage 445 hectares of forest. Although the village had no previous history of practising community forestry, the rapid decline of forests in the area during the 1990s compelled the community to take action. The process of organizing members of the village to address natural resource management issues has been similar to that of Kompong Phluk Commune; villagers elected a community forest committee and established appropriate resource management rules and strategies. Members of the committee are elected by secret ballot and the committee's term is five years. The roles and responsibilities of the committee are similar to those of the Kompong Phluk committee. The committee meets once a month to monitor progress. Extension meetings, held regularly, provide a forum for feedback from the broader community. In 1998, confronted with declining availability of forest products and unreliable flows of water from natural springs, the villagers approached the provincial forestry department for assistance. The forestry department, working together with the staff of the FAO project, facilitated the process of community participation in forest management. "We needed some help in organizing ourselves to protect our forest," recalled the chief of the committee. "We began working with the FAO team - looking firstly at the extent of resources in our village and then considering how we could best protect them." The result was the establishment of a community forest, along with measures to ensure protection of the area. Following the election of the community forestry committee, rules and regulations were established, along with the development of a five-year operational plan for the forest. Field facilitators from the FAO project assist the committee to prepare management plans. As part of the process, detailed discussions, sometimes lasting more than a week, are held among the committee members and the resource users, to designate specific management blocks, decide on management objectives and draft silvicultural prescriptions. "Our Operational Plan helps us to protect the forest and to know where to harvest poles that we sell for much needed income. It also reminds us that we need to protect the area around our spring, to make sure that it doesn't dry up," commented one farmer. The community protects the forest from outside intrusion and has stopped all agricultural activities within the demarcated forest boundaries. The management plan prescribes the blocks to be harvested, when they should be cut and how many trees can be removed. The area is dominated by forests of Lagerstroemia spp. and Dipterocarpus spp. - trees that effectively slow water runoff and reduce erosion and downstream sedimentation. Many of the "trees" in the forest are in fact spindly coppice shoots, originating from cut stumps. Harvesting operations are confined to blocks with many coppice shoots per hectare (20 000 to 30 000). Once the coppice shoots reach small pole-size, harvesting of up to 200 stems per hectare is allowed. Members of the community cut and sell the poles - these are used for fish trap construction - in the villages of Kompong Phluk and Kompong Kleang. A six-metre pole sells for about US$0.15. Harvesting using the coppice system is sustainable for at least three to four rotations - after which the stump may lose its vigour and the growth of coppice will deteriorate. In 2003, the community harvested 6 000 poles, which yielded US$1 575 from sales. Selective harvesting of poles from the community-managed forests is generating regular income for the Bos Thom community. The income is used for community activities and development projects, including the recent construction of a primary school. "We were very excited when we realized that we could make money from protecting and managing the forest and that we could use this money to help develop our community," noted the chief of the committee. The committee also uses some of the money earned from selling poles to help people with particular difficulties. The committee believes that further development of the village can be achieved by planting fruit trees, to provide fruit for home consumption and for sale, and development is progressing in this direction. In most cases, the upheavals of the previous decades, which have undermined the fabric of the community and the traditional knowledge base, make it difficult for communities to pursue collective and meaningful resource management. Economic and cultural disparities in fishing communities hinder community fisheries management, although this is not to say there is no will on the part of community members, government and NGOs to make community fisheries management work. Two areas that appear to be exceptions to this conclusion are Kompong Phluk Commune and Bos Thom Village, where significant progress towards collective resource management is being made. Both communities are reaping the benefits of natural resource protection and community management. In recent years, more and more policy makers from Phnom Penh and elsewhere have been visiting Kompong Phluk and Bos Thom to learn from villagers about how local resource management by local communes can work. In the case of Kompong Phluk, the community has realized a positive increase in fish catches. In Bos Thom, money from the sale of poles thinned from the community forest has provided welcome development funds and more reliable water supplies. These two communities illustrate that community-based management can work, especially when the community believes that resource protection and management will improve their livelihoods. These success stories are based on ensuring that communities have a voice and take an active role in managing their common resources. Melissa Marschke is currently pursuing her Ph.D. at the Natural Resources Institute, University of Manitoba in Canada. She worked in Cambodia as a consultant for the International Development Research Centre (IDRC) in a community-based management project from 1999 to 2002. Her research interests include sustainable livelihoods, community-based management and participation and decision making in resource management. A barangay is the smallest local government unit in the Philippines and often corresponds to a village or town district. Kasama means "companion" in Tagalog, one of the main languages spoken in the Philippines. Which translates as "friends of trees and living beings". The value in parentheses is for the number of days allowed for harvesting of the product. Village forest protection committees that comply with, and qualify for recognition under, Joint Forest Management prescriptions. N.B. This subdecree does not apply to the flooded forest area - only to the Bos Thom field site.